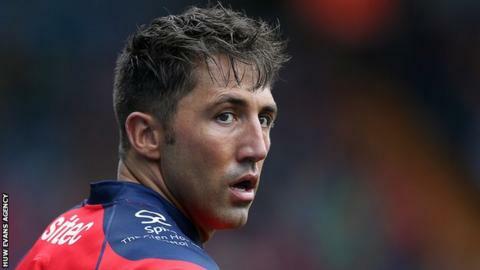 Gavin Henson "still has an edge" that can boost Newport Gwent Dragons when he joins them for 2017-18 from Bristol, says head coach Kingsley Jones. Henson, 35, will play for a Welsh team for the first time since he was sacked by Cardiff Blues in 2012. "He talks to you and says: 'I played against Jamie Roberts for 20 minutes and I had the upper hand then and I just got injured'," said Jones. "And it just shows that he still has his edge." Dragons' future may be in doubt amid proposals that would see the Welsh Rugby Union take them over in the summer. The Newport-based team began their search for new investment in April 2016. But Jones says the player "didn't mention" uncertainty over Dragons' future during talks that ended with him signing for the club. Former Wales flanker and captain Jones says Henson would love to play in their Judgement Day game against Welsh rivals Scarlets at Principality Stadium in Cardiff on Saturday, 15 April. He added: "If he could come and play for us, I'm sure he'd walk from Bristol to get a game and that's what he is - a big game player. "My challenge will be getting him over in Zebre, I expect, and those games, but we've got to manage him as well. "He's a consummate professional and it's invaluable to have him around to pass on his experience to those young players. "Henson will play fly-half and centre for Dragons while Jones remains keen on bringing in another fly-half ahead of next season." Jones is also still looking for another "experienced fly-half who can make us better". "We've got a little bit of money left in the budget, I'm looking for a fly-half," said Jones. "I've made no secret about that. I've got Gavin. I wouldn't mind one other with the right experience and there's two players I'm talking to. "One of them is close to signing for us and that's my shopping done, really." Jones says playing and coaching staff are working on the basis Dragons will be in existence next season, no matter what the outcome of a shareholders' vote, expected in May, that will determine the team's future. "You can read what you want about voting and different things," said Jones. "As far as we are concerned in the rugby department, we'll still be playing rugby as the Dragons next season and they'll want to play well."